Who is Michigan Targeting as an Offensive Lineman in 2016? 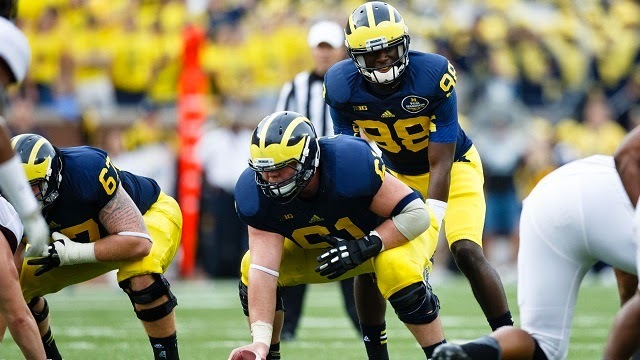 Over the past few seasons, the offensive line at Michigan has been a weakness. Recently, Michigan’s offensive line has struggled to create gaps for running backs and to protect the quarterback. With a brand new coaching staff with plenty of NFL experience now in the fold, there is high expectation that players will develop and continue to get better. On National Signing Day, Michigan brought in three new Offensive Linemen in; Nolan Ulizio, Jon Runyan Jr., and Grant Newsome. While Michigan does have good depth along the line of scrimmage, I would guess that they will more than likely bring in two more Offensive Lineman in the 2016 recruiting cycle. With Offensive Tackle Erik Swenson already in the fold, which other recruits are likely to fill the needed spots? Michael Jordan is a prospect that has had Michigan interest for a while now. He’s been on campus multiple times over the past year and seems to be forming a good relationship with the coaching staff. In my opinion, Michael is the best pure offensive lineman in the state of Michigan in 2016. Michael already has the size (6’6-285) to play Offensive Tackle at the next level. He’s got quick feet and can cover a lot of ground once the ball is snapped. Gets off the line of scrimmage quickly and engages with defenders. Has a very high motor and has good hand movements. Does a good job of extending his arms and keeping his feet moving while blocking defenders. Plays very aggressive and will finish all his blocks. Plays with a little bit of nasty side. Can pull off the line and set blocks up field. Very efficient in run blocking situations, as he gets off the line quickly and identifies his man. In pass blocking situations, he sets the edge well, and can defend from multiple angles. Michael is currently ranked as the #21 Offensive Tackle and #247 overall according to Rivals. He holds offers from; Michigan State, Ohio State, Nebraska, Penn State, and Notre Dame. Michael was on campus earlier this week, were he watched the football team practice. Terrance has a very respectable offer list including; Alabama, Georgia, South Carolina, Kentucky, Tennessee and Florida State. He is ranked as the #2 offensive guard and #155 overall according to Rivals. Terrance will also be in attendance for Michigan’s upcoming Spring Game according to 247’s Steve Lorenz. Ben is a recruit that has been on Michigan’s radar for a while now. He was recruited by both Brady Hoke and Jim Harbaugh. While Michigan had a lackluster 2014 season, Ben’s interest in Michigan never faded. Ben has good size standing at 6’5 and has room to add on additional weight to his frame. He gets off the line of scrimmage quickly and gets into his stance with relative ease. Possesses a very strong upper body, which he uses effectively to gain leverage on defenders. Plays very physical and will play till the whistle is blown. Does a good job of using his hands to push back defenders and rarely gets beat to the outside. Very polished when blocking the run. Does a good job of identifying his man off the snap and locking into him. Can break off the line of scrimmage with relative ease and set blocks outside the hash marks. Does an excellent job of keeping his feet moving while engaged with a defender. While Ben does have many good traits, he will have to work on his pass protection once he gets to the college level. Ben is currently ranked as the #3 Offensive Tackle, and #41 overall in the 2016 recruiting class according to Rivals. He holds scholarship offers from many high profile schools such as; Notre Dame, Ohio State, Alabama, Auburn, Oklahoma, Stanford and Wisconsin. At this point, I would guess that his recruitment will come down to a battle between Michigan and Wisconsin. Alex is a very intriguing offensive lineman prospect. When Michigan offered him a scholarship in January, it was his first FBS offer. Now, he holds offers from the likes of; UCLA, Boston College, Utah, and Cal. He’s seen a steady climb in his rankings, and now is ranked as the #17 Offensive Tackle, and #238 overall according to Rivals. Alex is a big bodied (6’6, 275 lbs.) offensive tackle for his Narbonne High School team. Obviously, since he’s only played football for one season, he’s very raw. Will definitely have to work on his technique, but for only playing for one season, I came away very impressed by his highlight film. Alex does a good job of using his massive frame to gain leverage on defenders. Has decent speed, and moves extremely well for someone his size. Once he arrives at college, a redshirt will more than likely be necessary. With good coaching and learning of technique, Alex should be a starter later on in his college career and have a productive career. "They have a great, great coach (Jim Harbaugh). They are very experienced. They know how to get people to the NFL, a lot of knowledge." Michigan will surely be one of the front runners to land the talented 4* recruit. E.J was offered by Jim Harbaugh and staff a few weeks after the coaching change. Although Michigan has had trouble plucking talent away from the South, E.J is a different story, as he lived in Michigan most of his life before moving to Georgia. E.J is a highly ranked recruit, and for good reason. His highlight reel is very impressive and shows exactly why he’s considered one of the top Offensive Tackles in 2016. He has a massive frame standing at 6’6 and weighing in around 310 pounds. He explodes off the line of scrimmage and instantly gets into his stance. E.J is extremely strong and it shows in his film, as he is constantly mauling defensive lineman. Does an excellent job of getting low and propelling his body upwards. Can get off the line of scrimmage and set blocks up field. Out of all the 2016 offensive linemen, E.J is most definitely in the top 5 for footwork. Equally as good in pass protection as he is run blocking. Wherever E.J ends up playing his collegiate career, he will likely vie for playing time early on in his career, as he is too good to keep on the bench. E.J is currently ranked as the #4 Offensive Tackle and the 56th overall recruit according to Rivals. He boasts an extremely impressive offer sheet including; Florida, Ohio State, LSU, USC, Alabama, Clemson, Tennessee, and Georgia. 2015 LB Chris Terech will be joining the Michigan football team as a preferred walk-on. Chris is considered to be a part of the 2015 recruiting class. 2016 3* LB Elysee Mbem-Bosse released his Top 8 on Thursday night, which included Michigan. 2016 4* QB Brandon Peters also released a Top 5 that included Michigan. At this point in his recruitment, I would say that Michigan is the front runners to land his services. 2016 4* WR Theo Howard committed to Oregon last Sunday. Michigan offered him by both coaching staffs. 2016 4* RB Kentrail Moran committed to Illinois on Saturday. 2016 4* QB K.J Costello took to Twitter on Friday to announce that he will be making his college choice on March 26th. With no visit to Michigan recently, it looks as if K.J will either land at Stanford or USC.